Before I dive any deeper into soil science, I thought I'd walk you through filling out Solomon's soil analysis worksheets (which you can download for free here). You'll notice there are actually six pages of worksheets in that file, which consist of two pages each for acidic soils (pH less than 7), "excess cations" soil (pH 7 to 7.6), and calcareous soil (pH greater than 7.6). I actually find it much easier to make a spreadsheet page for each soil sample since the program can do the math for me, but I'll fill out a worksheet below to help you get an idea of the process. Logan labs reports phosphorus pentoxide instead of elemental phosphorus, so you need to multiply their result by 0.44 to get lb/acre for phosphorus. The target column is a little more complex, but is mostly basic multiplication. The one portion that might cause a hiccup is potassium (K) --- you get that amount from the chart at the bottom-left of the worksheet based on the TCEC of your sample. 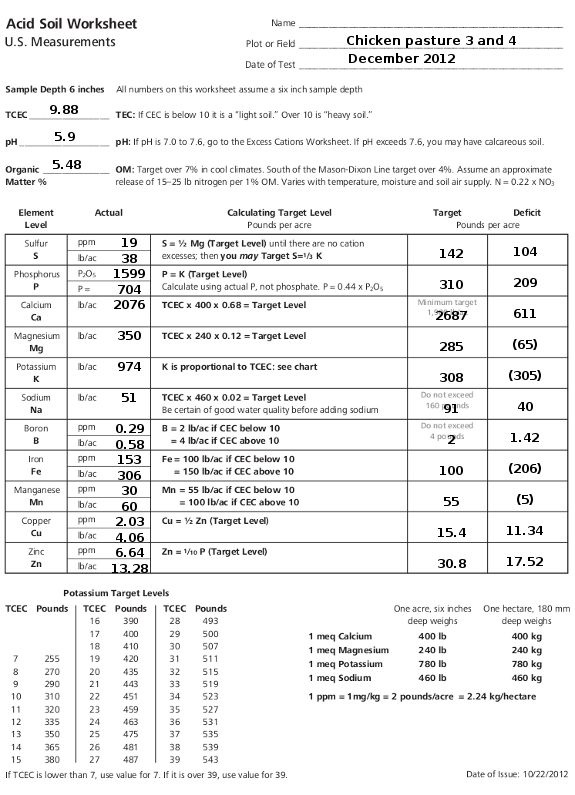 Similarly, boron, iron, and manganese targets are based on TCEC, as is explained in the "calculating target level" column. Finally, you subtract the actual amount of each element (in lb/acre) from the target amount to figure out how much excess or deficient you are. Since Solomon labelled the last column "deficit", I put excesses in parentheses. The sample I used is a pasture that has been grazed with chickens for a couple of years with no other amendments, so I figure it's probably similar to the soil you might find in a new garden spot. You'll notice the soil is acidic and a bit low on organic matter, without as much capacity for cations as you'd like, and it has too much of a few nutrients but too little of some others. Tomorrow, I'll move on to the back side of this worksheet to show you how to deal with those excesses and deficits. Our chicken waterer never spills on pastures, so it's perfect for permaculture chickens. When we are talking about ppm, we first need to know what exactly it means in this context, since it is a fraction of two measurements that have the same unit and is therefore dimensionless. E.g. ppm can be an elongation (in/in), solution by weight (lb/lb) or fraction by particles (e.g. mole/mole). Assuming that the report is in lb/lb and not in mole/mole, we need to figure out the dry bulk density of soil. We use the dry density because we are interested in the mass ratios of the solids in the soil. The particle density of minerals varies a bit, but not much. The dry bulk density of soil can vary a lot depending on the exact mineral composition, the amount of organics and the degree of compaction. It is generally reckoned to be between 1.0--1.6 kg/dm³. Six inches is 1.524 dm. One acre is 404685.64 dm². So this soil would have a volume of 616741 dm³. With the given dry bulk density range, you would have a dry soil weight of 616741--986786 kg, or 1359681 to 2175490 lb. So under the abovementioned assumptions, 1 ppm would correspond to between 1.36 and 2.18 lb/acre. One consultant suggests 3 ppm of Mo so the soil microbes work well. And humans do better with some V, Se, Ag, Cr. Once you have added greensand and seaweed to somewhere and it has settled in a more detailed soil report would probably be well worth it :). I gather you have no problem with having enough water :). David --- No, I made up my own excel worksheets based on his pdfs. I would have made mine available online, but they required more than just filling in the blanks, so I thought it would do more harm than good to share them widely. David --- Keep in mind I worked on this two years ago and have a terrible memory.... But as I look back at my data, it looks like I accidentally input the wrong data into the worksheet, using the information from a different sample for the actual amount of potassium. So, please ignore the 974 and pretend it says 613, and hopefully things will start to make sense! 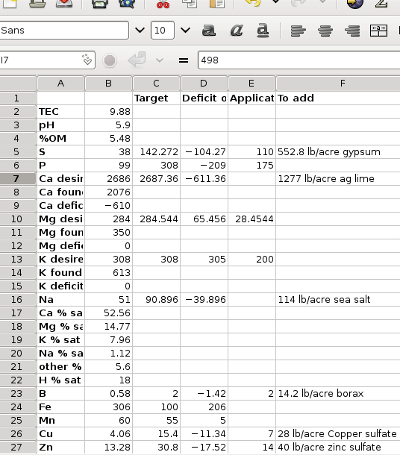 I also have created spreadsheets to automate the calculation of soil amendments. I have used them with success in three garden areas. I use the results to provide minerals to my gardens according to the Rev 03 worksheets from Erica Reinheimer and Steve Solomon. I do not guarantee or warrant my workbook to be free of errors or necessarily suitable for use by anyone else. I recommend that you fully understand the principles and practices detailed in the Rev 03 worksheets. My calculated results either match or or close to those generated by OrganiCalc. I believe I am more careful to define the specific mineral contents of the amendment materials I use. I offer this Excel workbook for your potential learning or use at your own risk. A zip archive is available for download from http://hillhousehome.net/Gardening/AcidSoil.zip. We are continually improving the methods Steve Solomon and I wrote in 2012 in "The Intelligent Gardener - Growing Nutrient Dense Food" We document the changes to our OrganiCalc worksheet, and every year or 2 release the changes as a hardcopy worksheet. There are many free apps on our site, and the latest release of OrganiCalc is still available for $9.50/year. I like to make comments on the results as time permits.